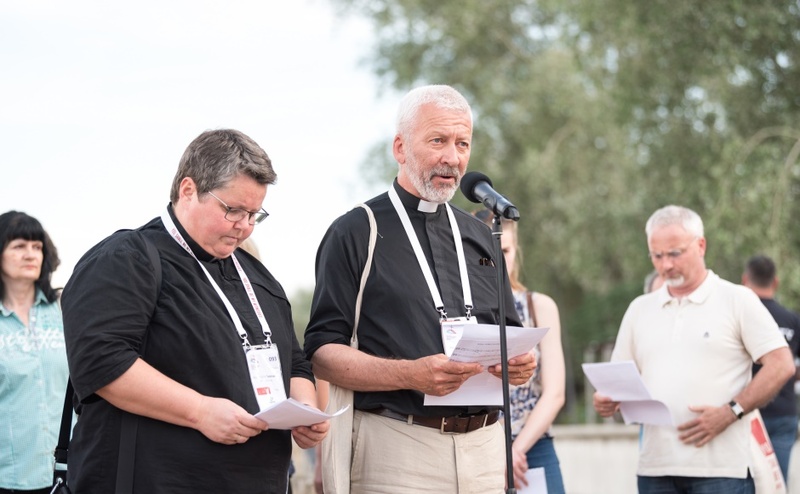 Christians from churches across Europe are gathering in Novi Sad, Serbia, this week for the General Assembly of the Conference of European Churches. Rev Dr Richard Frazer, convener of the Church and Society Council and Rev Alison McDonald, who has just completed her service as convener of the Ecumenical Relations Committee, are representing the Church of Scotland at the assembly. The procession started at a memorial commemorating the victims of the raid on Novi Sad in January 1942 during World War II. Hungarian armed forces occupying the region killed 1,246 civilians of the city, mainly Serbs and Jews, throwing their bodies into the Danube. The Archbishop of Canterbury, Justin Welby was a keynote speaker at the event. Young people aged 18-30, who came together for a youth gathering just before the assembly are also taking part in the assembly as delegates, stewards and advisors. 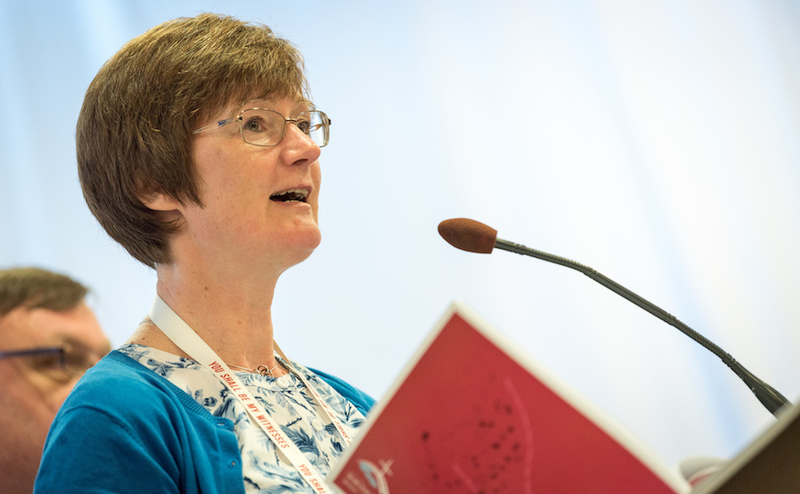 One of the largest ecumenical gatherings on the continent, the assembly will discuss how churches can live out a vision of witness, justice, and hospitality over the next five years. Dr Frazer said the young people had impressed the assembly with their wisdom, compassion and care for creation. “We heard a very powerful series of statements from youth delegates to the assembly,” he said. “They highlighted the science that is warning us that loss of habitat due to climate change is likely to see half the species of the planet wiped out within the lifetime of people alive today. Church of Scotland climate change officer Adrian Shaw also attended the assembly as volunteer notetaker. He helped write a new report on climate change called Sharing God’s Earth and its riches justly ( pdf file) which the assembly received this week. Conservation agency Scottish Natural Heritage has reported that 58 Scottish native species are at risk of extinction. “We are not afraid that we are followers of Jesus Christ. The Church witnesses. Jesus says, ‘You are my witnesses’ — to us too. “How do we re-evangelise without it being grabbing a microphone and shouting at people? That’s not evangelism. An evangelist has to be good news. “People will become Christian again…maybe even come to church again if what they hear is good news. The Conference of European Churches is a group of 116 Orthodox, Protestant, Anglican and Old Catholic Churches from all across Europe, plus more than 40 National Councils of Churches and Christian partners. Voice 1: All embracing God, Provider Supreme, author of time and space. We honour you, who cradles the Universe as a mother cradles her child. You set the stars on their course and have created this blue green gem of the earth, which is our home and our sanctuary. You have filled the earth with majestic mountains, fertile plains and nourishing rivers. We rejoice to live in this garden of your creating. You fill our mouths with laughter and our tongues with singing and we honour you for the many blessings we receive, but admit that we have done great harm to your creation and have failed to live up to our calling to tend and serve. Voice 2: So, we pray now for the world that you saw was good and that we have exploited. We ask for your blessing upon the earth, on all of life and upon our fellow human beings who struggle to know life in all its fullness. And we ask for the courage to change our hearts and live in such a way that the whole earth community might flourish. Voice 1: Living Christ, Bridge Builder Supreme, whose incarnation spans the gap between time and eternity, we honour you for your life among us, showing us the how to live with justice, compassion and community. In your life amongst us, you built bridges between peoples who had been excluded, you tore down boundaries that divided and gave all people dignity and worth. In your sacrifice, your reveal that, for people of resurrection faith, death never has the last word and you have given us the ministry of reconciliation, calling us to seek first the Kingdom of God. But we know that we have pursued other kingdoms, and that your words come with a warning, that unless we seek first the kingdom, the other things which we need for our lives will be denied us. Voice 2: So, we pray for those who have been forgotten and remain excluded in our world today that justice may flow down like a mighty stream. For peoples divided, that we may have the courage to ask for forgiveness and so be reconciled for the injustice we cause and the harm we do. For the people and land of Serbia who have known war and injustice in recent years, who, in this place, remember past atrocity. When the world loses its way, come to us with your wisdom that there may there be healing of land and relationships. And help us along the difficult path of peace making. For the lame and the lonely, the homeless and the dispossessed, we pray, that by your grace we may re-discover the deep blessing of hospitality, and meet you in the face of the stranger. Voice 1: Spirit of God, whose presence flows through our being, nearer to us than our breath, closer to us than our own pulse. We honour you for your sustaining, life giving presence. Like a great river, you nourish all, enabling us to become fertile ground, to become trees of righteousness, offering shade and bearing fruit. The fruits of the Spirt are love, joy, peace, patience, kindness, goodness, faithfulness, gentleness, and self-control. We know that some of these virtues have not always taken root in us and we have dishonoured the life of your Spirit that is planted deep within us. Voice 2: So, we pray for all those who are the victims of our lack of care and attention. For those we have harmed by things left undone, kindly words withheld or harsh words spoken. We pray today for those rejected because of beliefs, gender, race or sexuality. For the labelled and the branded, the victimised and the excluded. We stand in the light of your grace and mercy, mindful of our common humanity with all others, our relationship with all creation, and hopeful of a future shaped by justice and peace. These prayers we offer in the name of the Creator God, the bread sharing Christ and the nourishing Spirit. Amen.